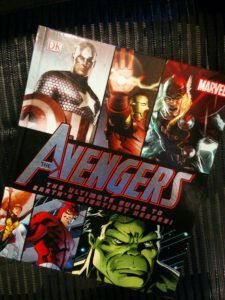 We picked up this book, Avengers: The Ultimate Guide to Earth’s Mightiest Heroes, at SDCC this year, and want to pass it along to one lucky reader. You have until Friday, 31st of July at 8pm PT to enter when we’ll randomly select our winners. * Because of the prohibitive cost of shipping abroad, we regret that this contest is only available to participants in the United States. Mission Accomplished: Followed on Facebook, Twitter, Google+, and Instagram, also favorited, liked, and retweeted for each of the four.